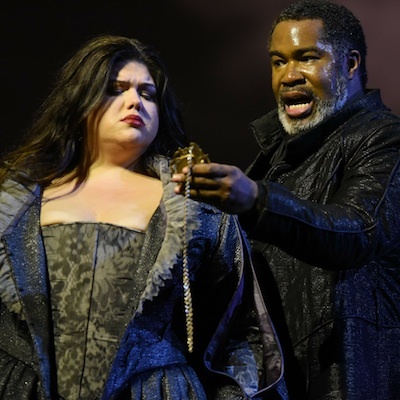 The fact that two major opera companies within 100 miles of each other are concurrently staging Verdi’s Don Carlo has caught national attention: Opera Philadelphia’s production opened Friday night starring Eric Owens, who is regular Metropolitan Opera fare (and excellent in his role debut as King Philip II here at the Academy), while the Met’s production wrapped up this weekend, ironically featuring Philly’s own Philadelphia Orchestra conductor Yannick Nézet-Séguin leading the work. 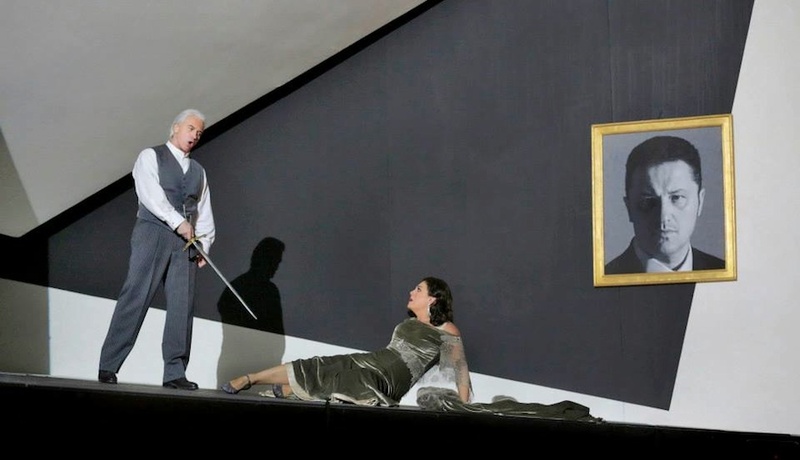 But just as serendipitous is the fact that last week, both companies opened two different dramatic Verdi operas—Un Ballo in Maschera at the Met and Carlo at Opera Philly—within a day of each other. Ironically, both productions have eerie similarities in their stagings, and yet, despite the sameness, they are as different as can possibly be. Both productions take liberty by moving the opera’s plot out of the traditional era in which it is normally set and moving it into a nondescript time period. The Met’s Ballo, a revival of the 2012 production by David Alden, has the feel of a turn-of-the-century film noir, although some moments feel even more modern: The great ballroom scene is literally wall-to-wall mirrors, which causes nearly a blinding effect from the audience’s point of view. Carlo in Philly, staged by Tim Albery, employs a rather dystopian setting, part Spanish crusades, part post-apocalyptic war zone. The stage is highly raked with a giant dome upstage that seems to be some sort of portal to the outside world. It’s eerie. This leads to yet another similarity to both productions: Directors Alden and Albery make deliberate attempts to turn these grand, sweeping Verdi operas into very insular works that, at times, feel almost like chamber pieces. The set for Ballo is a series of shifting walls that move effortlessly between the king’s chamber to a shipyard to a very small, enclosed, insanely small bedroom in act three where Anckrastrom (played with much gusto by the great Russian baritone Dmitri Hvorostovsky) plots the death of King Gustavo (performed with great fervor by Met regular Piotr Beczala). The monstrous portal that adorns the Academy’s stage for Carlo attempts to do the same thing: It gives a claustrophobic feeling toward some of the larger scenes, such as the mass burning at the stake at the end of the first act. This very well may have been done intentionally. Both productions also have sopranos in the midsts of love triangles who, in essence, steal the show. The utterly remarkable Sondra Radvanovsky plays Amelia in Ballo, and delivers a gut-wrenching “Morro, ma prima in grazia” in act three that literally gave me goosebumps. 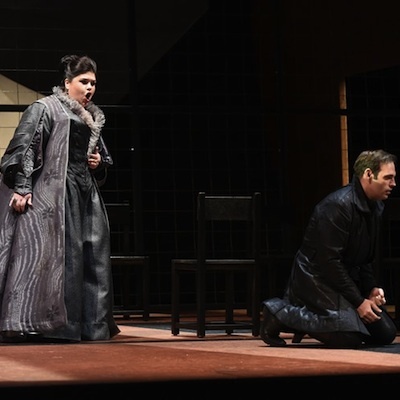 Ms. Radvanovsky is widely regarded as an expert Verdi interpreter, and as her voice soared through the halls of the Met, it’s not hard to see why:Radvanovsky’s is the kind of sound that radiates right in your face and you can’t help be emotionally moved by her gripping portrayal of Amelia. Opera Philadelphia employs Leah Crocetto as Elisabeth De Valois, and vocally, she was the absolute highlight of the evening. Ms. Crocetto’s clear soprano demonstrated a technical proficiency that was truly breathtaking, and her interpretation of Elisabeth demonstrated a unique juxtaposition of vulnerability and strength. Similarly to Ms. Radvanovsky, Ms. Crocetto may very well be one of Verdi’s masterful interpreters. The bottom line: For lovers of the art form, there’s two fine opportunities to catch productions featuring the trademark stylings of dramatic Verdi within a short car, bus, or train ride from one another. You’d be foolish not to see both of them. Don Carlo plays the Academy of Music through May 3rd; for tickets and more information, click here. Un Ballo in Maschera plays the Metropolitan Opera through May 9th; for tickets and more information, click here.